A Clay County native working as a police officer in Mobile, Alabama, was off duty and was not wearing a bulletproof vest when he was shot and killed Sunday afternoon, authorities said. Officer Sean Tuder, 30, died after he was shot multiple times during a scuffle with Marco Perez, 19, in the parking lot of Peach Place Inn, Mobile Police Chief Lawrence Battiste said Tuesday at a news conference providing an update on the investigation. Battiste said that Tuder was scheduled to be off duty Sunday when he got information from a source and received authorization to follow up on the tip from the confidential informant. He coordinated with an on-duty supervisor to apprehend Perez, who authorities said was wanted on federal charges and who Tuder had been tracking for a month. As Tuder pulled into the parking lot of the Peach Place Inn on Leroy Stevens Road, according to Battiste, Perez approached Tuder's vehicle, which led to a scuffle between the two. At some point, Perez pulled a weapon and shot Tuder, who was by himself and not wearing a bulletproof vest, multiple times, according to the police chief. Tuder later died of those injuries. Battiste noted that because Perez came up to the officer, who was working undercover, Tuder had to take action before backup could arrive on scene. The police chief said Tuder never had an opportunity to fire a shot. At one point, the chief said, Tuder had his weapon unholstered, but had to reholster his weapon due to the physical contact with Perez. Perez (pictured right) is charged with capital murder. 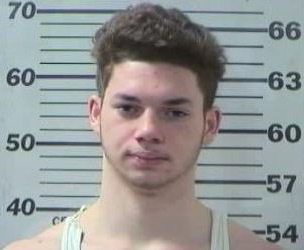 He was booked into the Mobile County, Alabama, jail and ordered held without bond, according to the Mobile District Attorney's Office. Mobile authorities said Perez was wanted on federal gun charges and was a suspect in 18 car burglaries. He was also a suspect in a robbery at a vape store. Perez and his mother are both charged in a plot to fake a kidnapping to avoid the teen being arrested last week on an outstanding warrant. Tiffany Perez was charged Thursday with filing a false report. Patches are being sold for $5 each to help the Tuder family.